A good, comfortable seat is nothing to sneeze at. The more so since we sit so much nowadays, be it for work, in the car, or just using a computer. I’ve lately been contemplating a new swivel chair for my desk. The one I’m sitting on as I write this post is a bit thin on the cushion. My back lets me know about this from time to time. In the meantime I’ve added a couple of folded-up blankets to try to appease my spine. Sometimes I work at my “standing desk”, which just means I place my laptop on a bookshelf that happens to be about chest height, a good level for typing on my feet. This got me thinking about Amish seating. Amish of course appreciate comfort. The seats they use vary, however, in how comfortable they are. 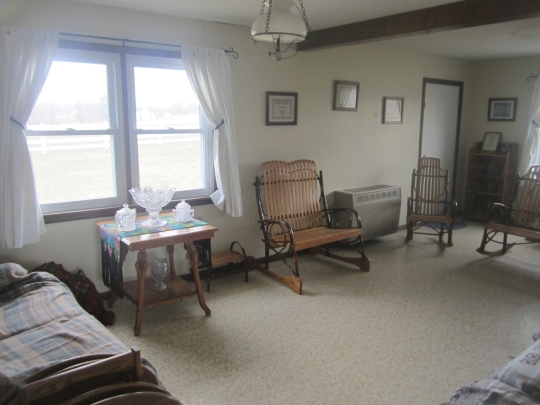 Below you’ll see various seats, including a hickory bench, rocker, and double rocker, which I took in Mark Curtis’ Ohio home. If you’ve ever plopped down in one of these, you know how comfortable they can be, despite lacking any cushion whatsoever. Especially the single rocker model. Maybe I need the Amish hickory rocker swivel work chair. I’ve yet to see that model anywhere, though, and I don’t know if I will. Kitchen table seats in Amish home are generally not too comfortable. Often wooden benches are used, similar to those seen in church, another place not known for plush seating. Maybe this is intentional, to keep you from lingering too long when there is hay yet to make. And as a family grows, you may just make do with whatever is at hand. An Amish friends’ little boys take turns parking themselves on a small step-up ladder at mealtime. In the sitting room, however, you’ll find much more comfortable seating, conducive to long Sunday visits or nodding off after you’ve polished off that last piece of pie. My favorite spot when I am visiting Amish friends in Lancaster County is a big recliner which essentially gets horizontal, kind of like those fancy first class airplane seats that turn into mini-beds. It’s easy to fall asleep in, and I think they spend as much time snoozing there as in bed. You won’t see recliners in all Amish homes, but you will in a lot of them. Where do you like to sit? Do you have a favorite reading chair? Work chair? Anytime chair? I actually prefer to cuddle up on the corner of the couch with the fireplace going, my Woolrich blanket, a good book, and a cup of coffee. The hickory bent chairs are beautiful and I have been thinking about buying one from an Amish family but I didn’t know how comfortable they were for extended periods of time. I did see that the chair was $50 less at their community run shop than it was at the consignment shop in town, so I know where I’ll be buying it! I have an antique upholstered chair and a foot stool. This is where I sit in the morning with coffee, do my reading, watch TV, sew, pray, etc. I have always had a rocker of some kind since becoming a grandmother. My sister has an oak Amish rocker she bought at a garage sale. I had never seen one in oak. Does anyone know if the Amish make them in oak or did she buy a replica? Not saying that your sister couldn’t have purchased an “Amish” chair that really wasn’t made by an Amish person, but I’d think that if oak is a readily available wood in the area where she purchased the chair then there shouldn’t be any reason that an Amish craftsman wouldn’t choose to use it. I have seen other Amish built furniture made of oak, I can’t say that I have ever seen an Amish built oak rocker either. That doesn’t mean that they couldn’t have made one though. As far as comfort goes, my rocker made by my friend Emanuel G. of bent hickory and oak is the most comfortable chair I have ever sat in. My wife would tell you I sit in it far too much! I don’t know if this link will work in a “comment” but here’s mine and my grandson’s rocker. An Amish seamstress has matching back and seat pads ready but I have not picked them up as yet. I used to have a beat up old recliner that was heaven to sit in. It has since gone on to it’s “glorious reward”. Now I have two very comfortable lawn chairs in my living room. I switch off as they are different colors, blue and green. I can’t imagine my living room with out them. My husband has his big ol comfy Man Chair as we call it, I prefer the corner of the couch.. or the rocking chair that was passed down from my husbands side of the family when we had our first born 17 years ago.. its comfy.. Unlike a lot of things I think chairs may actually increase in value as they become more worn and aged. The comfiest ones seem to be the ones that have been around a while and “adapted” to the user’s body and habits. I feel this way about some items of clothing too…I’d actually pay more for it in its present (older and worn) state than if I had to buy a new, and likely less comfortable, model. How many people have old recliners they are reluctant to throw out for this reason? I’ve had some pairs of pants and certainly shoes in this category. My chair and a half Lazt Boy Recliner is my favorite. I squashed the padding into the wood so I got a nice thick heavy duty cushion (to support my weight and lower back)and had a cover special sewn for it. How did you do? Where you a champion? Did you get the chance to make it a true daily double? If I where you, I’d try the test again, and see if you still make the grade. Alas, Slightly-handled-Order-Man, I was up against a 5-time champion on her 5th day — this was back when they limited you to 5 games — and there was nobody in the studio that day who could have beaten her. So I lost on Jeopardy…but I won a trip to Ireland, which was my consolation prize and was pretty darn consoling! But yes, I did get a chance to make it a true Daily Double. It was honestly the most fun I can ever recall having in half an hour! I’d love to try out again, but alas, you only get one chance unless they call you back for a special tournament or something. So I’m just trying to get my husband to try out. He’s not only MUCH smarter than me, he plays lots of computer games so he’s got faster reflexes, too, which is important on the buzzer. So far, no luck, but I hope one of these days! Sorry to wander so far afield from the subject of Amish chairs, Eric! I’ve been at grandma’s for Easter, just catching back up. No problem on wandering. Jeopardy is a classic show. How neat you were on, for that matter Trebek and Sajak both seem like very likeable fellows, I can see how those shows, which I always seem to think of as a duo, have lasted so long. They were the two main game shows I watched as a kid. Yes, I have a favorite old rocking recliner. It had a worn footrest when I got it at a consignment shop.It is a tan color but I think it has faded into that. As it becomes more worn I dread giving it up. My cats seem to favor it, too. That is absolutely great that you achieved far enough to get into the studio! A lot of people don’t even get that far. Look at that guy Tom who won the week ending Good Friday 2013 and had been trying to get there for thirty years, astounding. You can be immodest about losing on Jeopardy, that’s awesome. Mine is a couch. Its faux leather, black, and gets very hot in the summer, but I fall asleep quite easily after a long day, sometimes while watching Mr. Trebek’s above mentioned game show. Nothing special about it, I just find it comfy. Who has time for sitting? LOL When I do I tend to favor an old oddly angled recliner in our living room as well. Not so much for its comfort as for its proximity to the kitchen where it seems I am constantly headed and the side door in case I need to go outside with dogs or for something. I love all things wooden however and so miss my simple armless rocking chair from when our sons were babes. Debra seats, like a few other items, for instance cars, can really acquire a strong sentimental value, can’t they? This thought came to mind as I just got word that my old Ford truck, with 277,640 miles on it, sold today, and I find myself feeling just a tad sentimental about that. It’s an inanimate object of course, but we had a lot of years spent “together” and a lot of memories made. I suppose like you have for your rocker and your young sons. So nice to see a room that is set up for fellowship and visiting, not TV watching. Wish I could do that in my home. Not to be ugly here; why couldn’t you do that in your home? I suspect that you probably CAN do it in your home, too. We kept our most recent purchase of a TV to the size that will fit inside of our entertainment center (with the doors closed); no wall hanging behemoth TV for us. More importantly, we choose not to turn it on every day. For years we got up in the morning and turned on the TV & if someone was at home it stayed on until bedtime. Now we get up and when we go to the den the doors on the entertainment center stay closed as often as not. My wife will ask; “Do you want the TV on?” & very often I will tell her “NO, I really don’t”. I know that this is anathema to the average American household, BUT it is possible. Funny what meaningful conversations you can have when that thing is not blaring. Amazing what clarity of thought can come to you when you are not distracted by the blather from TV. There is something extremely relaxing about sitting in your den, living room etc with your spouse, each reading a book. Throw in a miniature Dachshund to sit on your lap & a cup of coffee, a book about the Amish and you have a little slice of heaven right in your own home. To help you get started I offer this mental picture; somewhere (maybe on this blog) I read about an Amish man that likened having a TV on in the home to taking a sewer line from the toilet and discharging it straight into the living room. Then he asked; “Why would you do that?”. He makes a good point. TV is increasingly just trash. Try limiting its poisonous influence on your family; you won’t be disappointed. We’re fortunate to have a separate living room and den, so the TV is in the den but the living room is TV-free. I definitely prefer to have a room that’s set up for just visiting. And all TV isn’t awful; you just have to be very selective. These days I tend to only watch things like informational programs about animals or the Earth or interesting cultures around the world; there’s lots of excellent and informative programming if you’re careful about what you watch. My kids are all grown up now, and my daughter doesn’t even HAVE a TV in her home, so clearly not all kids today are totally hooked on it! Got distracted replying to Carolyn (I hope she doesn’t take my comments as being rude or ugly towards her. I meant them as encouragement to try a sitting area sans the TV; even if it is just sitting there idle) Forgot the question at hand. Almost three years ago; when our youngest got married we turned his former bedroom into the spare bedroom for visitors, not that we have many. Then we turned what had been his older sisters bedroom & most recently the spare bedroom into a den. We never really had a true den AND a true living room before, but at the same time she inherited her grandmothers antique living room furniture which we had reupholstered. So we splurged on a leather recliner, couch and ottoman for the den. The recliner is kind of unique because it doesn’t have a part to rest your feet on, hence the need for the ottoman. It was purchased to be “my” recliner, but increasingly my wife prefers it to the couch. For whatever reason the corner of the couch has become my favorite spot. The Dachshund doesn’t care who sits where, as long as somebody has an open lap & a warm blankie she is good with it! So if having TV in a living is a lot like a sewer than what would having internet access in the home be like. The truth is the TV or the internet are not inherently evil, but like many other instruments TV and internet are utilized at the discretion of the viewer/user. Please do not take this as a personal attack Old Kat I am only stating my opinion. I mean no disrespect and certainly agree that in my experience a little less TV and computer time has improved my overall well being. I have seen way too many parents use TV as electronic babysitters.Of course the Amish don’t have to worry about that( I am a teacher).It is very easy to tell the children who read at home and those who spend most of their time watching TV.About 25 years ago,(fresh out of college) I developed a different perspective on TV. If you think of the purpose of TV is to advertise products of whatever sort, and the TV programs are nothing but filler between commercials, it becomes incredibly easy to click the “OFF” button. Why don't more people give up the TV? Interesting discussion. The idea of getting rid of the TV has come up many times before…I think an interesting question is why more of us don’t actually end up getting rid of the television, since a lot of people seem to feel it would lead to better use of time and probably more uplifting activities. I don’t currently have a TV but that’s not saying a ton as I do have a computer, which stands in for a TV for a lot of people now. However I do think there is a difference based in how you use it, and the somewhat more limited range of viewing programs via a comptuer. I don’t really watch shows though, however I am partial to some sporting events. I think one reason is that I got tired of following politics and the news, and viewing sports is a down time activity that is (mostly) free of that…it’s a place people can meet on neutral ground, and interact over team rivalries in a good-natured and friendly manner. Also my brother and I played a lot of soccer for many years, so we have that tie. Another good friend and I enjoy watching football. I think the problem with the television is that there is always something on. If I want to watch something I need to make special effort to watch via the computer or go somewhere there is a TV. And then I don’t just leave it on for whatever comes on next (a common habit when I lived in a house with a TV which leads to hours in front of the screen watching things you only have semi-interest in if that). I didn’t take your comments as an attack of any sort, Tom. I always enjoy reading your perspective. You are one of the many fine responders on Amish America whose comments I thoroughly enjoy. Your point about the internet as being as potentially capable, if not more capable, of delivering some proverbial “sewage” into our homes than television can is VERY well taken. I know that there is certainly some truly horrendous trash out on the internet. I know that I could easily find it and totally immerse myself in it if I wished to. I also know that there is at least SOME quality programing left on television, as an earlier poster pointed out. The difference for me is that on the internet I would need to SEARCH it out. Granted it would not be hard to find trash on the internet. Like the time when my kids were little and I was searching for a place that sold supplies to people who are interested in raising rabbits, as my children were. The company had the word “Bunny” in their name, but I couldn’t remember the exact name so I Googled the word “Bunny”. Oh, were the results startling! Unfortunately both kids were standing right there watching. I couldn’t shut my browser down fast enough to suit me. So, yes filth is available in mass on the world wide web. Increasingly, though, television just seems to be delivering programing that is tasteless, classless and total inane & I don’t even have to SEARCH for it. It is just THERE on many, dare I say, MOST channels? Even the old solid standbys like The History Channel , A&E and Discovery seem to be bent on filling their schedule with non-sense like “Swamp People”, “Ax Men” and “Amish Mafia”. Even those lame shows are down-right educational, thought provoking and entertaining (if not extremely far-fetched) compared to some of the stuff I see on television. Here is where I am coming from. It used to be said that TV was geared to a person with the mentality of an 8th grader. It seems to me that either 8th graders are no-where near as intelligent as they used to be OR they have now moved the target audience for television down to a lower common denominator; like about 4th grade. I certainly did not intend to offend anyone that feels that they benefit from watching the above mentioned shows and the plethora of other “reality” (or is it lack of reality?) shows on the air; I have just tired of them. I am also tired of the networks turning what started out as a cute and funny show like “2&1/2 Men” into a non-stop, blatant string of sexual innuendo. I get it, I really do … the producers of this crap have never matured past about the junior high age; so sexual innuendo is terribly funny to them, probably bathroom humor, too … but it leaves precious little to watch for those of us that have moved beyond that level of thinking. I also am sick and tired of the so called “objective” journalists that feel that they have to make some snide remark or pointed commentary in what is supposed to be a news program. Just present the facts without your filter & let us come to our own conclusions; I really don’t need an Anderson Cooper or a Sean Hannity, for that matter, telling me what I should or shouldn’t believe. I once read Walter Cronkite’s memoirs and was shocked to learn that he was a One Worlder and wanted to see the US melded into a part of a “universal” government. I would have never thought that, because he was a true journalistic professional who kept his opinions and preferences to himself. While I totally reject his way of thinking, to this day I still have immense respect the man for possessing the integrity to not try to cram that sort of idiocy down my throat. Again, if someone is inclined to believe that way … go for it. Just don’t ask me to buy it, because all I have to do is look at the United Nations and see what a miserable failure that way of thinking really is. I am not old enough to remember or to have experienced this, but my Father told me that in the 1950s, some of the stores in Winnipeg, and likely other cities and towns everywhere used to set up bleachers and, I think they sold tickets, to people in order to watch TV, particularly sporting events; the World Series, the Stanley Cup, Boxing, Wrestling. It’s amazing to me that people congregated together at such stores to watch television together – it is sometimes depicted in film. But, in that respect, television as an “experience” has become an isolationist thing, separating people from each other. The internet does the same thing, as much as it connects us, we’re still separate in our experiences, and it isn’t shared like television used to be in the above example. What was the blog entry where we (specifically Erik and I) discussed turning off your technology; the internet, televisions, cell phones etc, for a weekend, and discussed how hard it is for we English to do. Pardon me, but I got to go top up my cell phone [no, seriously, I do, I bought a prepaid card on Saturday and I didn’t do anything with it until tonight, Sunday) before I forget. Which tech could you give up? I got tired of the garbage of the tv so i shut down the satilite i got a small digital one i can watch when there bad storms cause live in area where theres tornados i want know when to take cover cause the radio can be nothing on its . I dont watch it otherwise . I have a tv that i have vcr an dvd player pluged into cause i like my movies . I have lived without internet an computers but i dont an cant see myself giving that up . Cause i been finding books read on my ereaders .